Think you have what it takes to be Rick Sanchez? It’s a tough gig! Dangerous space aliens are hunting him on the regular. Crazy dream-demon, Scary Terry, has tried killing him. The Devil isn’t a fan of him and tried putting his shop out of business. He once accidentally ruined an entire dimension with reckless use of a love potion, which in turn forced him to travel through the multiverse in search of a suitable new home. Speaking of other dimensions, the Ricks from all of the other dimensions want to punish him for his reckless endangerment of the Ricks from alternate universes. Whew, that guy definitely has some big shoes to fill! Maybe you could just PRETEND to be Rick Sanchez from Rick and Morty for a while. All you really need is this comfy Rick hat. This Rick and Morty beanie hat helps you cosplay as the one and only Rick Sanchez. 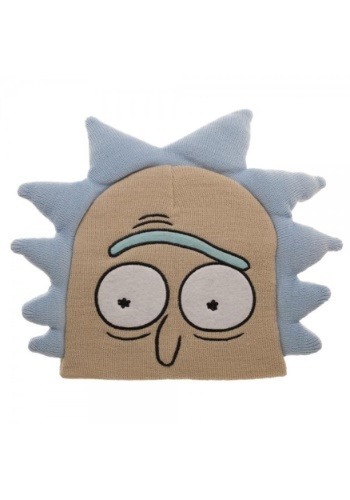 It’s a classic beanie fit, except it has Rick’s eyes and nose appliqued onto the front. It also has spiky white hair designed into the sides of the hat. Just put it on and you instantly get the Rick look. Creating a cosplay costume is easy! Just wear this hat and grab one of our many lab coats accessories and you’ve got an instant costume.